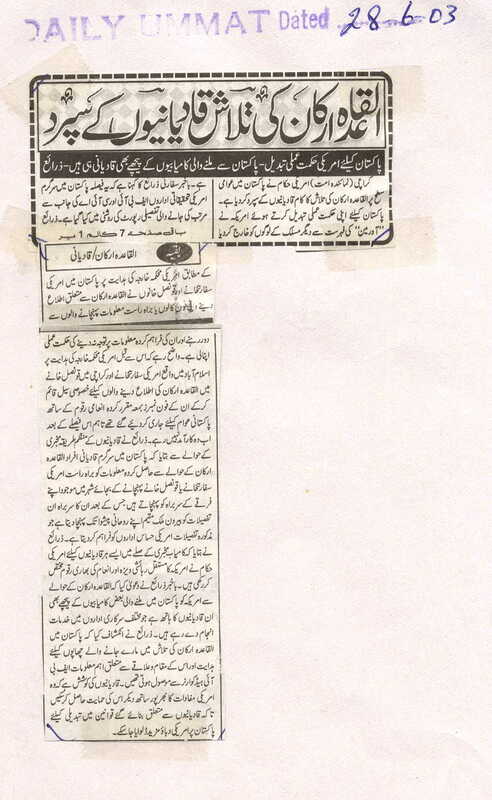 Recently a news item appeared in a Pakistani newspaper. American Strategy for Pakistan has changed. Qadianis are behind the succeses obtained in Pakistan - sources. Karachi (Ummat Representative) American officials have handed over to Qadianis the task of searching the Al-Qaeda members at public level. Changing this strategy for Pakistan, America has expelled people of other faiths from their list of 'Our men". Informed sources at the embassy said that this decision has been taken in the light of detailed report prepared by the active intelligence agencies in Pakistan, CIA and FBI. According to sources, upon instructions from American State Department, American Embassy and Consulates have adopted a policy of staying away from the phone calls or from those supplying direct information about Al-Qaeda members and not to pay attention on such informations. Note that previously upon instructions from Americal State Department, American Embassy in Islamabad and Consulate in Karachi had created a special cell to recieve information about Al-Qaeda members, and their phone numbers along with the amount of rewards were advertised for the Pakistani public. However after this new policy those numbers are no longer valid. Regarding the organised manner of Qadiani spying sources said that instead of delivering such information directly to Amierican embassy or consulate, active Qadianis in Pakistan deliver this information to the leader of their Jamaat in the city. The Jamaat amir then send this information to their spiritual leader staying abroad, who in turn hands over this information to American intelligence agencies. Sources said that all such Qadianis who deliver useful information, American officials are rewarding them with permenant residence in US and have set aside a substantial sum for them. Informed sources have said that those Qadianis are behind some of the successes obtained in Pakistan with regards to Al-Qaeda members, who are serving in various governmental agencies. Sources have revealed that the instructions to raid in search of Al-Qaeda members in Pakistan and important information regarding their location is recieved from the FBI headquarters. Qadianis are trying to give full cooperation to the American interests, to obtain their support so that more American pressure can be brought down on Pakistan to change the laws against Qadianis in Pakistan.